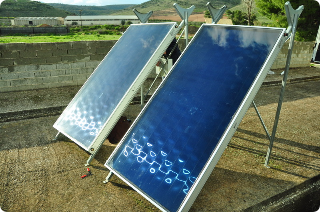 A cost effective and reliable method of stagnation control in solar thermal collectors, which will help improve system performance, reduce maintenance costs and extend the life of both domestic and commercial solar thermal systems. ​An elegant and simple method of protecting heat exchangers from the detrimental effects of fouling of the heat transfer surfaces has been developed for systems where one of the heat transfer fluids is routinely consumed or “made-up”. 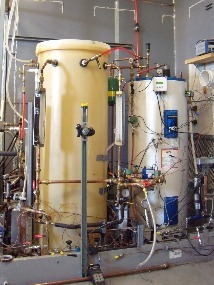 To test natural convection heat exchangers, an experimental procedure was undertaken in a controlled laboratory environment. 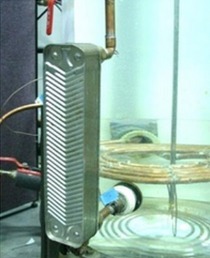 Two heat exchanger configurations were studied: an external, braised-plate heat exchanger and a spiral heat exchanger located in the storage tank. ​QSBRI is pleased to announce that it has completed accelerated fouling comparison testing of a brazed plate gas cooler installed with Passive Back Flow technology and a spiral gas cooler.